Downward heat losses are approximate 10 % with any underfloor heating system. Therefore it is always best to use some insulation on the FF also. We recommend a minimum of 30 mm insulation as this will prevent any rooms over heating on the ground floor. 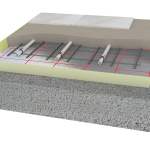 What pump will I get with my water/wet underfloor heating system? Can I order the underfloor heating online?